For the impatient, there's a screenshot at the very bottom. 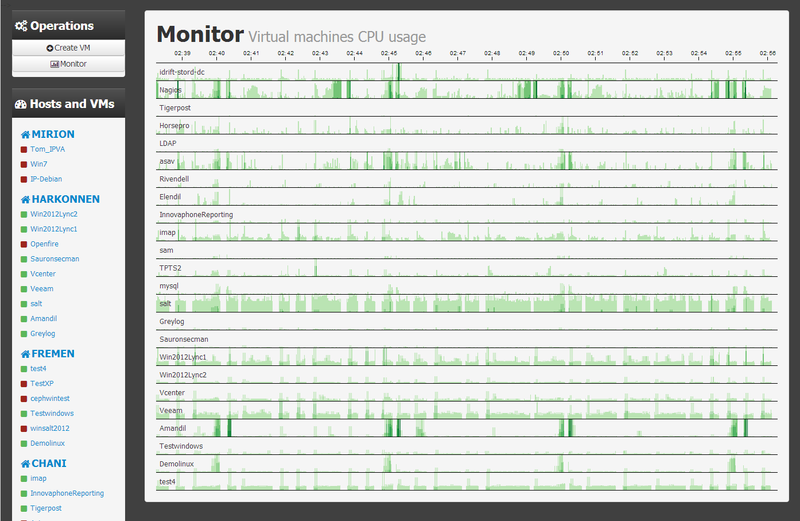 Monitoring is not easy. Fetching metrics and creating graphs is easy. But extracing insight from graphs is quite the other task. The way cubism works is requesting historic data for a time range, and then polling frequently the backend for fresh data to graph. In the setup I'm about to describe, there's no backend that stores the data I want to graph, so when the user opens up the monitoring it will start out blank and then start populating. For this proof of concept that's fine, since it enables me to graph data without introducing any new compononents into my existing environment. If I wanted this into production, I would use graphite, cube or even write a salt returner into mongodb for storing the time series data. for just the named VM, otherwise it will return all VMs. Include the requirements and specify the graph container. // Non-virt-hosts returns "not available"
// On mousemove, reposition the chart values to match the rule. 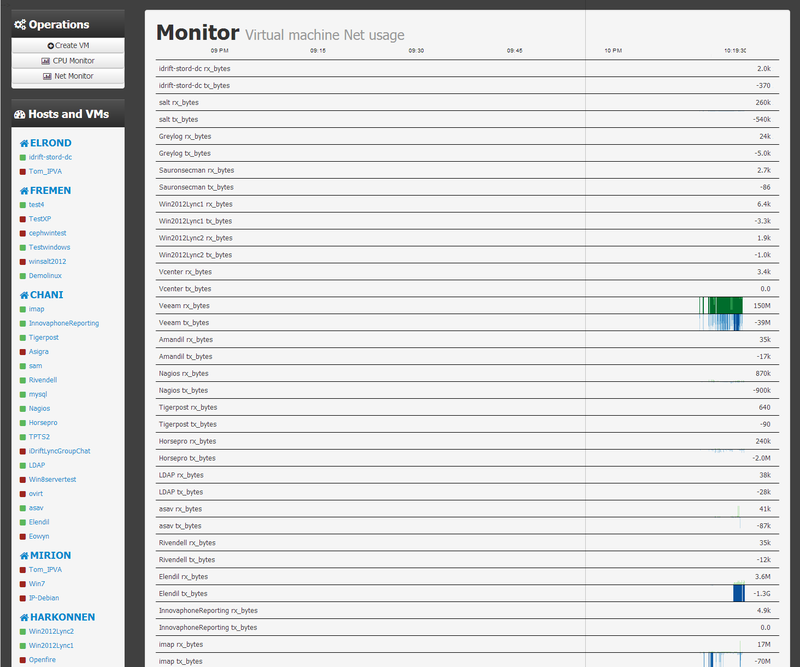 As you can see, most of my VMs in my test cluster are fairly idle. The default in cubism is 4 bands, so when green area is at full height of its 30 pixels, its corresponding CPU usage percentage is 25%. There is some choppiness in the graphs because I dont do any time interpolation and when some of the data does not return in a timely manner it will "queue" and get displayed as a spike. Several ways to fix this, either by not ever getting lost data, or interpolate in js. But again, a proper database backend will deal with this.